Input 1 and Input 2 are smoothed on all edges. 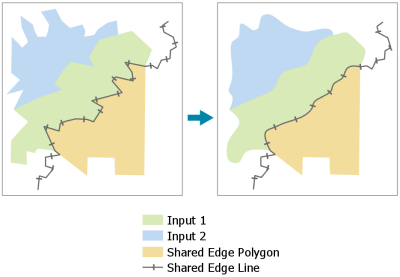 Shared Edge Polygon and Shared Edge Line are smoothed only along edges shared with Input 1 and Input 2. This tool modifies the Input Features and Shared Edge Features parameters. It does not produce new output feature classes. Smoothing is applied to all Input Features edges and only Shared Edge Features edges that share an edge with any Input Features edges. Shared Edge Features edges that do not share an edge with at least one Input Features edge are not smoothed. The lines or polygons to be smoothed. PAEK — Calculates a smoothed polygon that will not pass through the input polygon vertices. It is the acronym for Polynomial Approximation with Exponential Kernel. This is the default. BEZIER_INTERPOLATION —Fits Bezier curves between vertices. The resulting polygons pass through the vertices of the input polygons. This algorithm does not require a tolerance. Bezier curves will be approximated in the output. Determines the degree of smoothing. A unit can be specified; if no unit is specified, the unit of the input will be used. This is only used for the PAEK algorithm. The parameter will not appear on the tool dialog box when Bezier interpolation is selected and, in scripting, a value of 0 must be used. Line or polygon features that will be smoothed along edges shared with input features. Other edges are not smoothed. Point, line, or polygon features that act as barriers for smoothing. The smoothed features will not touch or cross barrier features. This stand-alone script shows an example of using the SmoothSharedEdges tool. # in_features (1st argument) are smoothed.